What makes North Dakota so different? One factor is the rapid development of shale oil and gas, as in Pennsylvania. But another is that North Dakota has a public bank — a bank that has been owned and operated by the people of North Dakota since 1919. Because of the Bank of North Dakota, the state weathered the crisis of 2008 far better than most. North Dakota has not had a single local bank failure in more than 20 years. Unemployment is half that of Pennsylvania. How does it work? All state taxes and fees must be deposited in the Bank of North Dakota, which also is open to deposits from communities, institutions and individuals. The bank makes loans — including loans at less-than-Wall-Street rates to public agencies — with the “profits” returned to the state for public purposes. 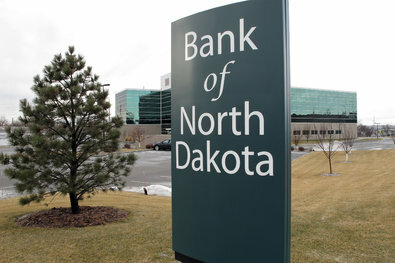 The Bank of North Dakota has for a decade returned at least $30 million per year of non-tax revenue back to the state, contributing to the state’s regular budget surpluses. This million. Not bad for a state with a population of 670,000 — just a little over half that of Allegheny County. Since this has worked so well for North Dakota, why haven’t more governments followed this path to prosperity? This question is now being raised in several counties and communities across Pennsylvania. Initiatives for public banks have or will be proposed in Philadelphia, Reading, Luzerne County and Pittsburgh, and more are popping up around the commonwealth and the nation as people learn just how effective these banks can be for local and county governments and their residents. Public banks keep local money working locally by partnering with and not competing with local banks and economic development agencies. They make affordable, job-creating credit available for private or public/​private developments and municipal financing. Public banks offer no retail banking services and do not steal the customers of local banks, as Wall Street banks do. They keep interest rates as low as possible on bond issues for municipalities and school districts. And, more importantly, the interest paid comes back to the community since the community owns the bank. A well-run public bank, such as the Bank of North Dakota, can deliver a higher return on equity than most other investments a government or authority can make, and a much safer return to boot. And this return comes back to the community that owns it, not to some Wall Street hedge fund for gambling on derivatives or paying stratospheric salaries. Public banking in Pittsburgh could help build a stronger community, upgrade crumbling infrastructure and shore up the economy, providing better-paying jobs and greater opportunities for the graduates of this region’s exceptional schools and universities. The Pennsylvania Public Banking Project, a 501(c)(3) nonprofit organization, is now working across the commonwealth and here in Pittsburgh to demonstrate and eventually bring to fruition the benefits of public banking. Check out the banking project’s website at publicbankingpa.org for updates and for locations and dates of informational seminars. Public banking is banking for Main Street, not Wall Street. John E. Hemington Jr. had a varied career and retired as information technology director for The Watson Institute in Leet. He is chairman of the advisory board for the Pennsylvania Public Banking Project (jehemington@verizon.net).